And so on to film two in the trilogy of things we've not got round to writing about - the snappily titled Three Billboards Outside Ebbing, Missouri. Three Billboards (as it shall hereafter be known) comes to us from director Martin McDonagh - he of In Bruges and Seven Psychopaths fame. It also promised to not be simple and straightforward. And on the latter, that was certainly correct. 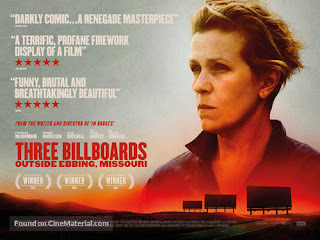 The story centres on Mildred (played wonderfully by Frances McDormand), who seven months after her daughter was raped and murdered decides to take some action by putting up three billboards asking what chief of police (Woody Harrelson) is actually doing about it. And yes, that's the short synopsis. It's basically a murder-mystery comedy thriller with a side-order of romance. And, as such, it is at times hard to watch. The laughs are dark and twisted, but that's never a bad thing, while the violence and language (given it's only a 15) are both blunt and brutal. The performances are all top-notch, which really helps, with Sam Rockwell and Peter Dinklage adding light and shade to the two lead stars. But this is a hard film to balance, which is where it can struggle a bit. The shift from comedy to drama is sharp at times, while the shift from comedy to thriller is even sharper and leaves you wondering what happened to the nice film you were just watching. Again, not necessarily a bad thing, but it throws the viewer off - leaving you playing catch-up for the rest of the movie. It also means you walk out of the cinema wondering what the hell it is you just watched. I mean, it's literally got everything. There's even a kitchen sink. It just takes a while to realise this is a kind of a good thing. Yes, sure, there's too much going on and it's too long - but how many films do you find yourself thinking about several weeks later? How many films do you want to go and watch again because you're sure you missed something - and could watch at least a dozen times and still think you've not seen everything? In an age of Pixar and Marvel behemoths, it's refreshing to enjoy being challenged and entertained simultaneously by a film tackling a dark subject with a cracking sense of humour. well I missed the kitchen sink but...a DOZEN times? Are you insane?